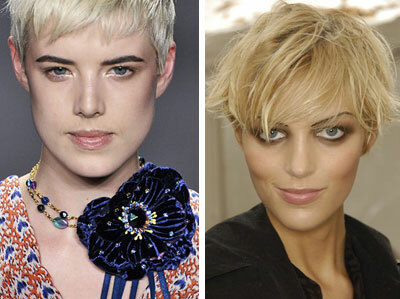 Spring is almost here and it is just about the right time to have a glance at what our hair will look like in 2008. Most of my model friends have already had their hair experimented with for the different shows this season (nope, I am keeping my long waves). I will not continue on this painful topic of hair experiments for the shows, as it will be just way too painful for my readers and for my girls. Just believe me on this one, there are designers that don’t care how your hair will look like after the show is done and if it will suit you at all. Nope, their job is to make a trend. As we are getting closer to the topic, I am warning you, I will NOT discuss here those “trendy” haircuts that make girls look like homeless creatures who have fun sticking their fingers in the socket. 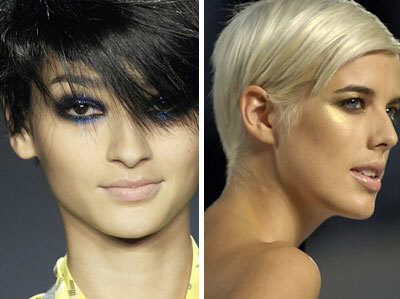 Even though some fashion magazines think those could be “the hottest hair hits”.Ok, let’s see what haircuts, styles and colors are worth a consideration in our highly fashionable everyday life! The bob… is not going anywhere. 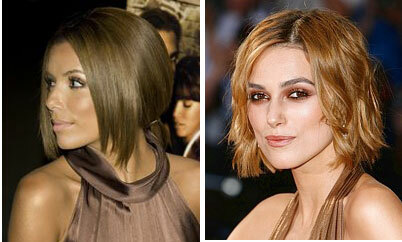 It is so popular, both models and celebrities went for this cut. The fringe. 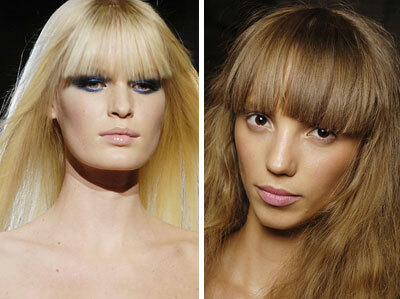 Blunt cut fringe remains the most popular way to wear this hair trend. 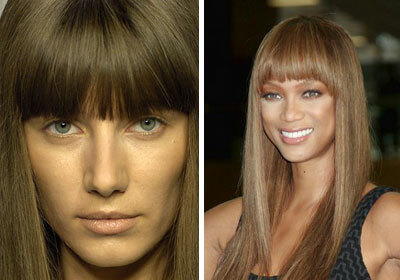 Depending on the cut the fringe is able to make your face look sweet or edgy. The crop. This spring hair trend can scream independence, but it can also be translated to young and funky, or sharp and elegant depending on how it is worn. Looks like these short crops are best matched with blond hair color and plenty of attitude. Dare to go for it? 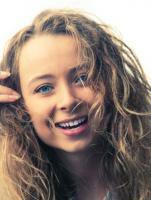 This springs best hairstyles and colors are greatly matched on the pictures below. Natural healthy hear is your most expensive accessory. There is a rule of feminists– I don’t remember the season when we went for the girly style and didn’t go for the boyish hair. Only this season we don’t say boys, we say MAN! Striving for masculinity! Ukrainian “iron-lady” Yulia Tymoshenko, the vice president of the country didn’t strive for masculinity in her look, but got the greatest political power in the country. It was only the matter of time when her unique hairstyle would be picked up by the fashion designers. So, here is the feminine look with the secret power. This idea doesn’t look new, but it will look innovative, active and fresh on you. Try braiding your hair to the microbraids. It is going to be huge this season! No mysteries. The rule for this spring hair colors is simple– it is either natural like dark blonde, light brown and dark brown, or bright colors like pink and purple. This spring will we be dying our hair only to bright, vivid colors. So here are the colors you should be sporting in 2008. Spring is coming! Let’s be gorgeous! P.S. Melissa, I think this longer bob could look great. I would add two pink streaks if your hair is dark like on the last picture.